Tokyo University of Agriculture Professor Suzuki is planning a firefly habitat at a junior high school. Each year, teachers and students from the Tokyo school visit Gunma to study fireflies. This year I was also invited. Fireflies need clean water and darkness. According to Professor Suzuki, creating habitat in the city also requires a “social design.” The temple, cemetary, and senior center near the school are also invited to participate. When we arrived at Kawaba-mura, the school girls weeded a rice field and played with frogs and crabs in the creek. Even though they are city kids, the students are very brave. At night, we saw Genji fireflies and Heiki fireflies. There are a lot of fireflies on the edge between the forest and the rice field. We stayed at a hotel called “Nakano Village” which on the inside is Japanese modern style, and on the outside the building looks like part of the hillside. It was designed by the famous Sakakura Associates. Kawaba mura has many apple orchards, and recently they are also growing blueberries. How can gardens be created in multiple connected sites? How can all city and country kids learn about each other’s environments and lives? How can cities begin to value darkness as essential to their vitality? How can kids and adults create habitat and support wildlife where they study, work, play, and live? I am making a new flower pot series at Shiho ceramic studio. I was inspired by the texture and glazing of another student’s bowls, and wanted to create something simple. The vertical lines on the right-side pot connect with the drainage channels on the bottom and also provide contrast and something to grip. The left-side pot was an experiment in removing material without compromising structural integrity. A fellow student suggested this would make a good candle holder. After they’re baked the first time, I’ll apply the glaze. Usually I leave some parts unglazed so that you can see and feel the ceramic directly. It’s a credit to the Shiho teachers that my amateur efforts turn out look more intentional and better designed than I am capable of. I like that they encourage me to do what I want, and yet somehow always ensure that my work turns out OK. That’s evidence of great teaching! Summer days in Tokyo are difficult with the heat and humidity, but evenings are very pleasant for walking and getting around. Twilight is especially beautiful now. It’s very impressive how quickly 7-Eleven can install new lighting. LEDs are a huge shift in lighting, and this very prominent example will influence millions of consumers. Many companies have agreed to large energy reductions, up to 20 and 25 percent. I noticed this van outside my local 7-Eleven yesterday. They changed the store’s lighting to LEDs without closing the business. Another store I passed yesterday in western Tokyo was also updated. I wonder how soon all the 7-Elevens will be using these very low energy lights. I think the new strips of small lights produce a more pleasant light than the old fluorescent tubes. What do you think? Through this blog, I was contacted by Edoble, whose tag line is “free food everywhere, in Tokyo.” Last month Edoble organized a hassaku marmelade party at a small shoutengai in Nakano, not far from where I live. Edoble’s founder Jess Mantell is a Canadian designer, doctoral student, city explorer, and community organizer. As you can see from the poster above, she’s a great illustrator, too. At Keio University, she previously led a team that created an iPhone app that tracks movement across Tokyo with city sounds. Edoble’s hassaku marmalade making event was great fun. Hassaku is a citrus tree that I often see growing in older gardens in Tokyo. The tree is very robust, and the fruits bright orange and large starting in winter. Seeing them makes me feel like there’s a bit of Florida or Southern California in Tokyo. But everyone had told me that the fruit is inedible. Jess’ idea was to bring people together to harvest and prepare hassaku. It seems that if you pick the fruit at different times, the taste changes. Jess spotted mature hassaku trees in an abandoned city middle school near her house in south Nakano. She asked permission from the ward office to harvest the fruit in the spring, and several city workers unlocked the gate and joined her in collecting and sharing the fruit. That alone is pretty cool. In June, Edoble hosted a marmalade party as a public event at a small space that is shared by the shoutengai association. On June 11, about twenty people very rapidly peeled the fruit, eliminated the membrane, put the seeds and membrane into a cheese cloth, and then boiled everything in four large pots. It was fun to see the amazing knife skills, particularly the older women and one young nursery school chef. We even got some help from some neighborhood kids. The workshop was super-inspiring. 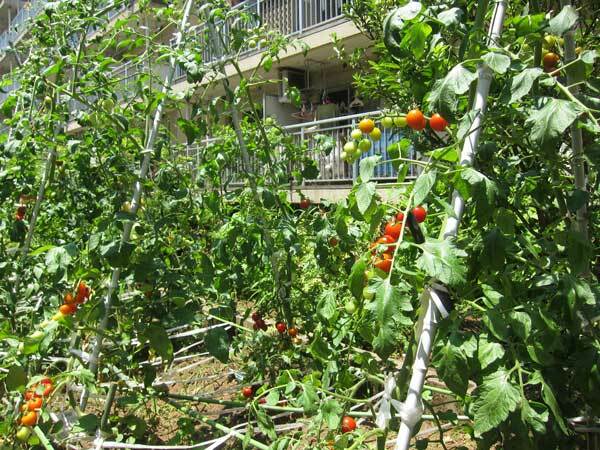 It is great to realize how much food is growing in Tokyo, and that we can join with our neighbors in collecting and preparing super local food. Edoble’s accomplishment was in bringing together residents and local government, children and seniors, mostly Japanese and a few foreigners, mostly women and a few men. Edoble reminds me that cities can grow a lot more of their own food, and that residents enjoy opportunities to work together and share food. Urban foraging is low cost and high return. Recently I visited the Ghibli museum for the first time. The exhibits are fun, and the whole experience is very Miyazaki: a blend of Western influences in a very Japanese fantasy world. I particularly liked the recreations of Miyazaki’s work space, overflowing with books and drawings. I was a bit surprised at the overflowing ashtrays: undoubtedly realistic but a little odd for a children’s space. I love how the building itself blends in with the surrounding park, with green walls and roofs, articulated spaces, and mature trees everywhere. It’s an appropriately magical environment that dissolves the lines between people and nature, inside and out. What a clever idea! This simple metal structure places four flowerpots on a traffic cone. It’s very space efficient because all four are in a single line, with a slight variation in height. It’s wonderful to see how the University of Tokyo is carefully removing two mature ginko trees as it breaks ground for a new law school library. The Hongo campus is gorgeous, both for its brick buildings that are vaguely ivy league and art deco, but also for its stunning trees and Sanshiro pond. The frantic pace of construction and reconstruction has left Tokyo with an inadequate tree canopy. It’s great that these two trees will survive the new building, and that the University of Tokyo demonstrates that it values its natural environment. Everywhere I walk in Tokyo, I see loquat trees (called biwa in Japanese 枇杷) on the sidewalks: planted between the sidewalk and roadway, next to a Royal Host, coming out of a shrine. Loquat seems well adapted to Tokyo, and it’s great to see such huge trees full of orange fruit and accessible from the street. I have to keep my eye out to see if the neighbors eat them.